This RIDGID 15 Amp 10 in. Heavy Duty Portable Table Saw with Stand is equipped with a 4000 RPM motor. It features an updated table saw utility vehicle that provides single-point release for simple 1-step setup and great job site portability. You can easily complete jobs with this saw's user-friendly onboard storage for your miter gauge, extra blades, rip fence and other accessories. 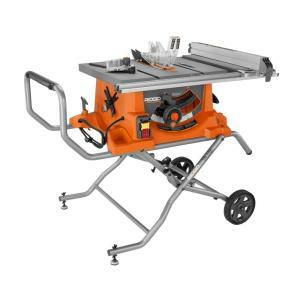 Tbook.com crawls the web to find the best prices and availability on Table Saws and related Tools and Hardware products like Ridgid 15 Amp 10 inch Heavy-Duty Portable Table Saw with Stand. For this page, related items include products we find that match the following keywords: "Table Saw" at our vendor partner Home Depot. Ridgid 15 Amp 10 inch Heavy-Duty Portable Table Saw with Stand is one of 60 Table Saws and related products listed in the Tools and Hardware section of Tbook.com If you have any questions on this product, please give us a call at 734-971-1210 during the hours of 9am - 5pm EST for assistance. Thank you for shopping at Tbook.com, the Internet Department Store!